#Bridgeport CT–#Westport CT– Bridgeport Police are asking for the public’s help identifying The female in the photos below. She attempted to cash a check in Westport that had been stolen in a burglary on Tremont Avenue in Bridgeport. 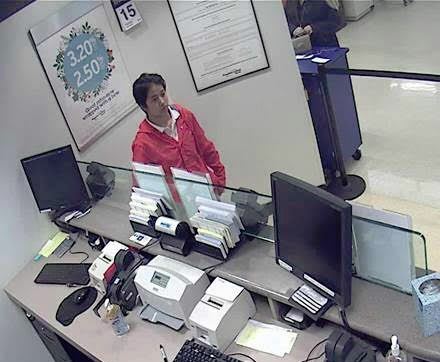 Also newsworthy is this is from an actual bank camera and you can actually make out the details! La policía de Bridgeport está pidiendo la ayuda del público para identificar a la mujer en las fotos de abajo. Intentó cobrar un cheque en Westport que había sido robado en un robo en la Avenida Tremont en Bridgeport.